You really should make this pie this December. This post is dedicated to my dad and my father-in-law. I am dedicating this post to my dad because he gave me the adorable pie cutters that allowed me to make the fancy leaf border in the picture above. If you are like me and have difficulty crimping the edges of the dough, then you should definitely get some of these. They make your pie look impressive with very little effort. If you are wondering why I am also dedicating this post to my father-in-law it is because of how much he loved this pie. I took three pies to my in-laws for Thanksgiving, this pie, a pumpkin pie, and a pecan pie. This was the first pie my father-in-law tried of the three and after this pie he did not bother with any of the others. 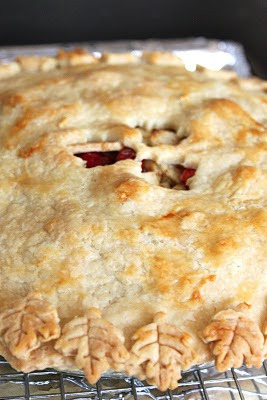 Now everybody who tasted this pie thought it was delicious, but he really loved it. His actual words regarding this pie were "I think I will take the rest to bed with me." You can imagine we all got a good laugh out of that. I know Thanksgiving is over and it would have been nice if I got this post up for you before turkey day, but like many of you I was busy cooking, baking, and traveling. If you are looking for a special dessert for an upcoming Holiday Party or even a Christmas Dinner, this definitely fits the bill! Thanks Bridget of Bake at 350 for sharing the recipe! Preheat oven to 425 degrees Fahrenheit. Lined the bottom of a glass pie pan with pie crust. In a large bowl stir together the sugar, flour, salt, and cinnamon. Set aside. Peel, core, and slice the apples approximately 1/4 inch thick. 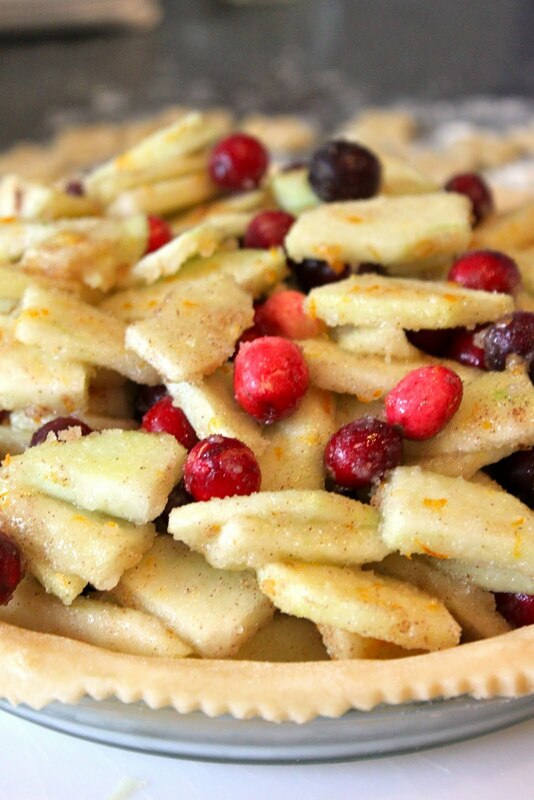 Add the apple slices, cranberries, and orange zest to the sugar mixture and toss well. Pile into the prepared pie pan. Top with bits of butter. Cover the pie with the top crust and vent as desired. Brush with beaten egg white. Bake for 20 minutes, then reduce hear to 350 degrees Fahrenheit and bake 40-50 minutes more, until the fruit is tender when pierced with a knife. Check the crust periodically and tent with boil if it browns before cooking through. Bakers Note: I have prepared this recipe in the food processor and by hand using a pastry cutter. It is definitely easier with the food processor, but tastes just as great doing it by hand. 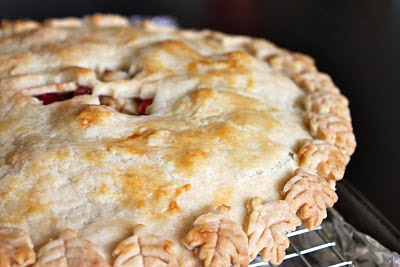 This is by far the best pie crust I have ever tasted! Pumpkin Pie - It is never too late!